I got tired - tired of seeing icons on shelves in Maya disappear and noting that even when working, flipping to shelves to change the tool set that was being used meant the pipeline tools that I'd painstakingly developed would be hidden in a shelf that probably wouldn't be set back again when needed. What I came up with for my 3rd year 3D students for their current group production was a neat little side bar to make their pipeline cleaner and more streamlined. Ooh! What a pro, Kev! This article is all about how you can approach building your own UI solution to make sure your team always have their tool set available. But enough talking - let me run over the process. 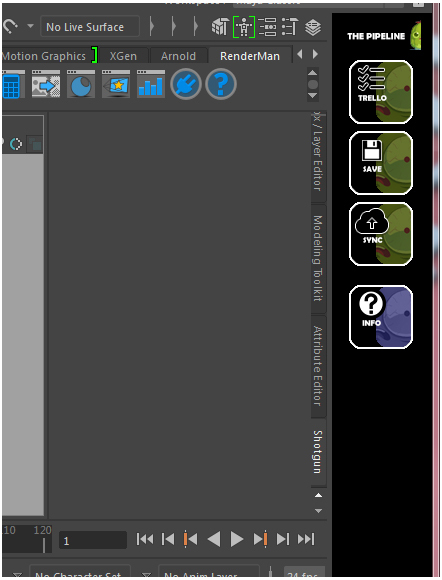 For my UI, I decided I'd like to have a slick vertical strip of buttons that I would use to call my other tool scripts. I created a simple UI with a column layout to produce what looked like a vertical tool bar. I set a nice margin in the column layout to push the contents in from the edges a little, and added in basic buttons. I also set the background to something that would stand out - in this case, super-slick black. I always find classes are, eh, classy for a lot of my script code. So I've built the tool bar UI example here as a class, with each button click firing off a function. It doesn't necessarily need to be a class, but why not. 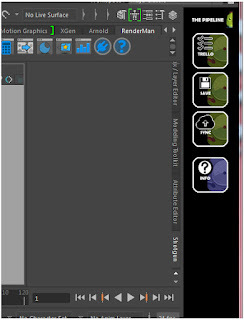 Later on, I may find that I want to create a flexible 'custom window system' class to make building new UI's easier. Hmmmm - now that's an idea... In which case a class is a nice way to build from... but maybe for now I'll just leave that for later. print "Button 01 was clicked"
print "Button 02 was clicked"
print "Button 03 was clicked"
To make an interface attach to the side of Maya, that's just a case of using the dockControl() function instead of the common showWindow() function used when we create pop-up windows. One thing you can run into are those users who decide as cool as a tool might be, they prefer to close windows and keep the UI the way 'they like to work'. This can (and does) eventually create headaches later downstream when one person decides to not stick to the rules. The dockControl() has a very handy couple of parameters we can use to make sure that the tool bar stays put. The parameter mov=False is what prevents the tool bar being undocked/closed. fw=100 defines the width the bar will be (100 pixels). ret=False is used to define if the window contents are retained in memory if the dock is closed (somehow). Making this false ensures if it does get closed, its removed cleanly. Note that I also defined a simple function that will be called to open up the tool bar. This function I added as its what Maya will need to call when it first starts up to initiate our tool bar. If we run the code, it should compile without error. Once done, you simply need to call the function that launches the tool bar called setToolbox()... Then - ta-daaaa - a vertical tool bar on the right side of Maya should appear. Plus, if we resize the main Maya window, our dock stays attached - maintaining its 100 pixel width at the same time. With the tool bar locked on, the tools stay and ensure artists can always access them. Great - once we change out the print statements in our functions with calls to our scripts, our tool bar is ready and the job is done... Well, almost! When Maya starts, it will look for this script - we can make use of this opportunity to check files, set project folders, or in this case launch and set up the tool bar. But - one problem. userSetup is called BEFORE the Maya UI is started, and just inserting it into the script won't necessarily work... Luckily though, Maya has a function called evalDeferred() which will tell Maya to run a command after the UI has started. Setting our tool bar script to launch is as simple as placing this into the userSetup.py file as follows. Note that in this example, the toolbar script was saved as myToolBar.py - making sure to keep an eye on the case used (ie. myToolbar is different than myToolBar when it comes to importing a module. If you stick to using camelCase then you can minimise small typo issues like this). We need to import this, then call the function using the executeDeferred() function as shown below... Here's my userSetup.py script. Once we're done - close Maya (if its running). Restart Maya and watch... If it worked, then after Maya kicks in, we should see our tool bar magically appear, just like it was part of the UI itself! Yus! If you've gotten to here - you're now set to build your awesome new TD tool kit for your production team! 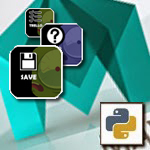 Slot in your tools, your scripts and go to town on making something pro! As with all coding, there are bound to be the occasional syntactical error pop up and cause issues. What you won't see when you start the script this way are python error messages. After finding it somewhat infuriating to never see the tool bar appear, it became very clear that any time this wasn't working, it was down to sometimes the most simple python errors! Here's a few bullet points to help. (A) Firstly - check your userSetup script for typo's or errors, including the aforementioned imported module filenames. (B) If it looks good - check the tool bar script itself. If that looks good - you'll need to check any other script you've imported or called to see which one had an issue. (C) Likewise, check any third party dependencies (one example was the installation of the requests module needed to run a Trello task management script was not installed on the machine that the scripts failed on). Once you've resolved issues, got your script to automatically pop up on start up - well done! You're now qualified to impress your team with your amazing custom tool kit! Icon's can look oh-so-much-sexier than text buttons. I designed a collection of these and replaced by button() commands with symbolButton() instead. This type of control let us use images as buttons. Nice, and much cooler of course.